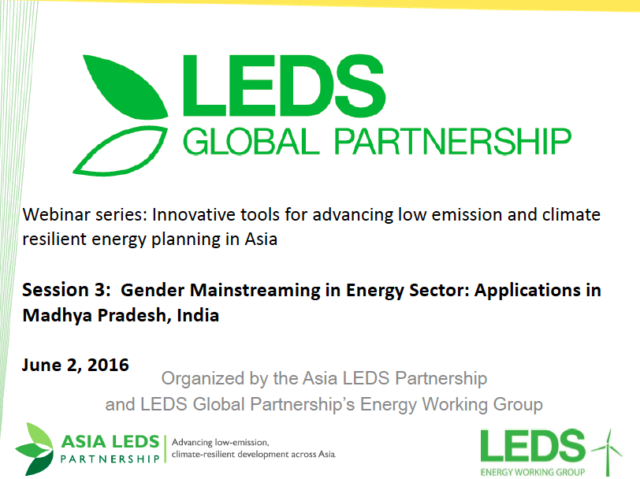 This webinar is a cooperation of the Asia LEDS Partnership and the Energy Working Group of LEDS GP, the Gender Equality for Climate Change Opportunities (GECCO)* initiative, a five-year program launched by USAID and IUCN in 2014 which overall goal is to leverage advancements in women’s empowerment and gender equality, and ENERGIA, the International Network on Gender and Sustainable Energy. It demonstrates how gender methodologies have been designed for the energy sector and applied in Asia. Click here to see a PDF of the presentations.